This is an easy one and one you probably don’t need to read. However it does point back to the marinara sauce recipe which is what’s really important. With a little crusty Italian bread to soak up any excess sauce on the plate, a glass of red wine, and Billy Joel playing on the stereo, it doesn’t get much better. After making the marinara sauce (see previous post linked here), cook some spaghetti according to box directions, put spaghetti in a plate, spoon marinara sauce over the spaghetti. Top with grated parmesan cheese. Pictured below is thin spaghetti with the infamous tomato sauce. I actually cheated here and put some ground beef in the sauce to make my wife happy. 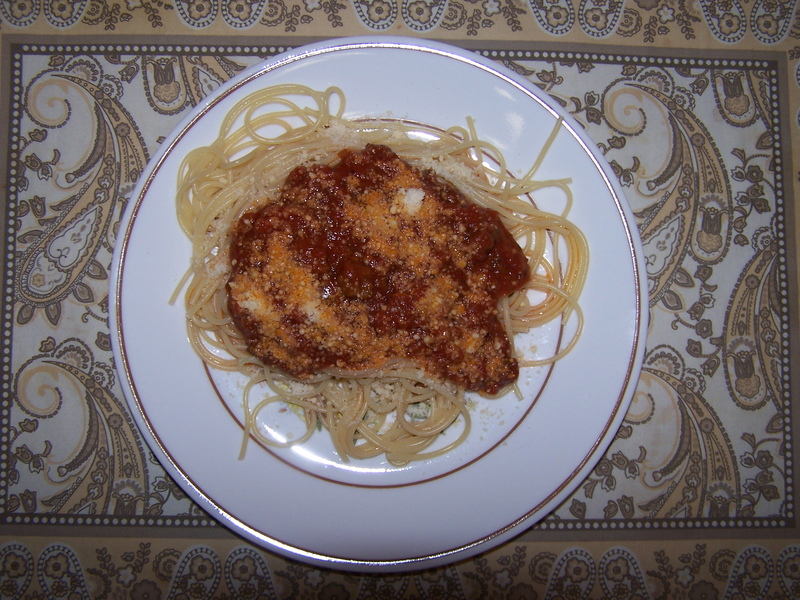 The meat is optional and not needed (see marinara sauce recipe). Cooking times are important to avoid mushy spaghetti. The thin spaghetti in the picture takes only about 6 minutes in boiling water. If you drain in a colander, you can hit the spaghetti with a quick shot of cold water to slow down any further cooking. This entry was posted on 02/05/2010 at 00:25 and is filed under Recipes, Recipes, food, cooking and related items. You can follow any responses to this entry through the RSS 2.0 feed. You can leave a response, or trackback from your own site.